When we achieve equitable development, we increase the capacity of people of color to strengthen their communities and determine their own future and that of their neighborhoods. We distribute the benefits and burdens of growth equitably among people of all races, ethnic backgrounds, incomes, and geographies/neighborhoods. We encourage multicultural communities where tenured and newcomer residents can thrive. And we provide meaningful choices for the most impacted people of color to live, work, and define their own culture throughout all neighborhoods. To achieve this ideal, we need a systemic approach that can create those kinds of outcomes. This requires coordinated and comprehensive investments, policies, and protections to prevent displacement of vulnerable residents, businesses, and community organizations. 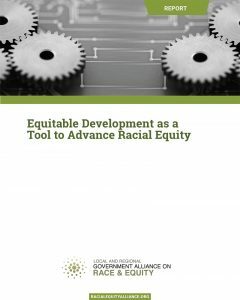 That approach should address the two major obstacles to achieving equitable outcomes related to development: 1) involuntary economic and cultural displacement of communities of color and 2) inequitable access for communities of color to the key determinants of social, physical, and economic well-being needed. A clear policy framework is helpful for developing, implementing, and measuring effective strategies. Strong communities and people. People and communities with stability and resilience in the face of displacement pressures fare better. An intact community in which people are able to have high quality jobs and financial security; culturally appropriate goods, services, and support; and strong social networks that support the acceptance of a range of cultures has better outcomes. Great places with equitable access. A city where all neighborhoods are healthy, safe, and afford their resident access to the key determinants of well-being promotes inclusion. Equitable development strategies presented in this brief aim to achieve the above policy goals and operationalize the definition of equitable development.